Falcon BA BF XR6 XR8 Models. BA BF XR6 XR8 models Ford Falcon BF XR8 Sedan and Ute. Falcon BA BF XR Models New Black Housing with Chrome Embazzeled Projector Headlights. DRL LIKE, LED, Ford Falcon BF Models. 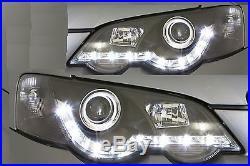 BRAND NEW in box Projector LED headlight set (LH & RH pair) for Ford Falcon XR8. Direct replacement for the original headlights or head lights. Philips Silver Vision Indicators Bulbs (Pair). (these are chrome silver in colour when off but they indicate amber orange when turned on, eliminates reflection when they are off). These DRL Trading products are E-Marked, ECE-certified / ADR compliant, and meet all "E" regulations. (ECE: Economic Commision of Europe). ADR Compliance, please read ADR notice at bottom. Upgrade your Ford to an Audi R8 look. Upgrade your vehicle with this coolest style Black Housing R8 DRL Style LED Projector Headlights with only the fraction of OEM. Elegant styling and top quality after-market product. We are the makers of these lights. We are Ford owners as well. Item in brand new condition. Attaches to factory mounting points. They are plug and play, but Sometimes a little wiring may be needed if wiring has been played with, altered or changed on your car. However, Professional installation is recommended. Package Includes : One left and one right(pair, set) Black headlight units. 1 Pair - Black projector Audi R8 style LED headlight set (left & right). All bulbs are included 2x H1 bulbs (high beam), 2x H1 Bulbs (low beam), 2x Indicator bulbs. FITS The Following Ford Falcon Models. BA Falcon XR6, XR6T, XR8 02-04. BA MKII Falcon XR6, XR6T, XR8 04-05. BF Falcon XR6, XR6T, XR8 05-06. BF Falcon MKII XR6, XR6T, XR8 06-08. Guaranteed to be an exact fit for your Ford. Plug compatible with factory wiring. Item comes complete with original packaging. These lights are designed by DRL Trading Co, made exclussively to us in Taiwan by Sonar Auto Parts (one of top 3 manufacturers of aftermarket parts), using the highest quality products, extreme precision, state of the art tooling and machinery, highest engineering supervision, including our own supervision and repeated testing procedures. They are not made in China -with respect. We stand behind our products. UNECE Regulation Approvals These DRL Trading products are E-Marked, ECE-certified / ADR compliant, and meet all "E" regulations. All ECE certified aftermarket parts need not any further ADR certification as they become ADR compliant. Postal runs are daily, Monday to Friday. No post on weekends or Bank Holidays. Couriers CAN NOT deliver to PO Boxes , so there must be someone home or business to sign and receive the product. Items that have been fitted or are not in original condition are not refundable or returnable. We strongly recommend professional installation by qualified installers. By qualified professionals: 1-2 hours. We are trying to provide an installation video on the website to be downloaded by buyers, it will be available once ready. Other countries: Sorry we do not deliver outside of Australia. Courier Companies do not deliver to P O Box addresses. Return authorisation number RA No. Must be obtained from us before item can be sent back to us. The item must be in saleable condition with original packaging and complete with all components and accessories. Under what circumstances can you return the item? For example, does the item need to be in the unopened box it was posted in or can you return an opened box with all of the original materials? The parts that we supply are intended for installation by qualified installers. All items at the risk of the Purchaser once they are sent. This store trades in Australian dollars. We do not accept foreign currency. Monday to Friday (excluding Holidays). We do not answer any emails over the weekends and inventory. The item "New LED Black Projector Headlights for Ford Falcon BA BF XR6 XR8 Models DRL Like" is in sale since Monday, July 28, 2014. This item is in the category "Vehicle Parts & Accessories\Car, Truck Parts\Lights, Indicators\Headlights". The seller is "drl-trading" and is located in Belmore NSW, Aussie seller, New South Wales. This item can be shipped worldwide.